Copyright Toshiba Tec Corp All Rights Reserved. Most offices use large volumes of paper, and many people try to reduce their paper consumption, especially considering the negative impacts on the environment. In practice, however, they have a hard time doing it because, for example, they find it more accurate and efficient to see documents printed on paper rather than on a screen. Toshiba Tec Corp. has proposed a dramatic solution to address this problem. With a change in thinking, they came up with a plan to cut paper consumption, not by reducing the amount of printing done (something required to have a paperless office environment) but by re-using the paper repeatedly using a decolorizing ink process. To test the concept, the company developed its eSTUDIO306LP/RD30 paper reuse system, which consists of a multifunction peripheral (MFP), an erasing machine, and special ink. Toshiba Tec has four main business focuses: (1) a retail solutions business that supplies products to the distribution industry, including point-of-sale (POS) systems; (2) an office solutions business that supplies digital MFPs to offices; (3) a supply chain solutions business that develops and manufactures auto-ID systems with barcodes or radio frequency identification (RFID); and (4) an inkjet printer cartridge business. The company asked, "What can we do to develop our business to contribute to reducing environmental impacts by using our technological capabilities?" While seeking answers to this question, they found out a great deal of energy is used in the papermaking process, resulting in large amounts of carbon dioxide (CO2) emissions. In Japan, paper manufacturing is the fifth highest emitter of CO2 emissions, by industry, in fact much higher than the electronic component or electric and gas industries (see Note). Note: According to Greenhouse Gas Emission Data of FY2010 by Mandatory Greenhouse Gas Accounting and Reporting System based on the Law on Global Warming Countermeasures, published by the Ministry of the Environment (MOE) and the Ministry of Economy, Trade and Industry (METI). Also, they found an indicator showing that there was not a big difference between new paper and recycled paper in terms of CO2 emissions from the papermaking process, and then realized that recycling paper does not reduce CO2 emissions very much. Meanwhile, they conducted surveys on paper use in offices and found that about 90 percent of paper was thrown out within a week of being printed on. Most of the discarded paper was being recovered and recycled as reclaimed paper. Even so reusing paper, not recycling it, has less environmental impact. Wishing to build a system to realize a closer cycle, the company developed its paper reuse system. The paper reuse system consists of an MFP (the eSTUDIO306LP model) that copies and prints using Toshiba Tec's unique "de-colorable" ink toner, along with an erasing machine (the eSTUDIO RD30 model) to erase any print from the paper. The decolorable toner is blue when printed, and it turns colorless when heated to a certain temperature. In addition to the special ink that can be erased, the Loops system allows making any written text colorless using an erasable pen, called Frixion, manufactured by Pilot Corp., a Japanese major office supplies manufacturer. Therefore, by using the pen, the paper can be reused even after notes or check marks are made on the printed document. The Loops unit also has a sorting function, which automatically sorts paper into reusable and non-reusable after erasing and discharges them into separate trays. One sheet of paper can be reused an average of five times, and depending on the amount of printing and the condition of the paper, it can be used more times than that. Without providing specific advantages to customers, any environment-friendly effort will not be fully employed or lead to a reduction of environmental impacts. The Paper Reuse System was developed with the concept of providing economic performance and efficiency plus a smaller environmental footprint. From the environmental aspect, when the same piece of paper is used five times before recycling, the eSTUDIO306LP/RD paper reuse system cuts CO2 emissions over the five-year life cycle by about one ton (see Note), which is approximately 50% less compared to conventional MFPs. The life cycle estimate includes material, manufacturing, transportation, disposal, and recycling, as well as during use, erasing, and then remanufacturing the paper. The CO2 emissions reduced are estimated to be the equivalent of the volume of about 260,000 plastic bottles (500 ml). Reuse of paper also contributes to a reduction in water use. In five years, Toshiba Tec calculated saving of 800 tons of water (see Note), equivalent to about two 25-meter swimming pools. From the economic perspective, by using the same paper five times, paper use is reduced by up to 80%, enabling a significant reduction in paper purchasing, storage, and disposal costs. In terms of efficiency, changing operational styles and work routines (a requirement of going paperless) is unnecessary, because the conventional approach of printing on paper is maintained while reducing environmental impacts at the same time. Just by setting the paper on the erasing device and pressing a switch, the system automatically sorts reusable and non-reusable paper, which makes reusing very easy. In addition, the need for storage space as well as the time for storing and searching for information can be drastically reduced, because the printed image of each page is digitally saved before the erasing process, making it no longer necessary to store the information on printed paper. The special features of this unique paper reuse system were made possible by the decolorable toner and ink technology exclusively developed by Toshiba Tec. The structure of the ink consists of a special tiny capsule (measuring just over 10 microns in size) and inside is a smaller capsule containing the following components: a coloring substance, a color developer, and an adjuster for color change. When heated, the particles start working to achieve decolorization of the ink. Conventional MFPs fix the text and images onto paper through heating and pressing the toner, thus it is necessary for the new system to use lower temperatures to fix the print than those required by the decolorization process. Toshiba Tec made the paper reuse system possible by developing a new device that can fix the print at much lower temperatures compared to conventional MFPs. In 2011 when the system was in the development stage, the company won the Environment Minister's Awards for Activities to Fight Global Warming. The awards are given to groups and individuals to honor their outstanding achievements of the year in global warming mitigation, as part of a strategy to promote global warming measures. The company was applauded for contributing to the reduction of paper use for printing as well as the CO2 emissions from paper manufacturing. The company also won the "Green IT Awards 2013," which included the Minister of Economy, Trade and Industry Award, as it was announced on September 18, 2013. The Green IT Award was established by METI in FY2008 in order to further promote green IT initiatives centered on "savings in IT-related energy consumption" and "energy conservation through the use of IT." The awards have been presented for devices and efforts which have produced superior energy-saving effects. Toshiba Tec was also applauded for realizing a new environment-friendly work style with a high degree of freedom. The company decided to participate in an exhibition at the nineteenth session of the Conference of the Parties of the United Nations Framework Convention on Climate Change (COP19), which is to be held on November 11-22, 2013. A total of 37 booths will be on display, and Toshiba Tec is among the companies selected. 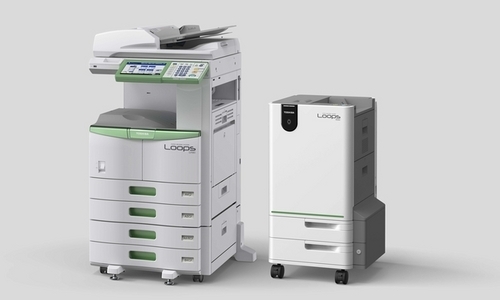 The eSTUDIO306LP/RD30 paper reuse system was created as a result of Toshiba Tec's idea of reusing paper and its technology to realize that idea, which can reduce the large volume of paper used in the office and put less burden and stress on users compared to the conventional approach of trying not to use paper. We hope that use of the technology will spread widely, thus contributing to the creation of a more sustainable society.